Mile 7. The tough climb is done and I’m riding by T2. There is Francie Campbell directing traffic…”hey Francie!”. I haven’t seen any gals in a while and wonder if they are coming up behind me. I see the first guy in the International race go by. I hope that means Troy is near too. There he is! “Go Troy! You’re two”. He passes with a big smile on his face and says “go Honey!” Yeah, I’m so excited for him! Mile 14. I’m at Lake Arthur and still see no women. There are a few guys out here and I’m working on reeling them in. Mile 21. Finally in Weimar! It’s always hard to ride up Geisendorfer Road but it’s done! I looks like my mph is down from last year’s race but I’m seem to be staying ahead of a lot of women. I get to Canyon Way and get aero. This is the best place on the course to fly and I take full advantage…weeee! I’m getting really close now to these 3 guys. Every time we get to a hill, I get closer…and more hills are coming. I see our friend Bob directing traffic for us cyclists. I smile and wave. To Tokayana Way where we climb over to the Bear River Canyon River Campground. I catch 2 of the guys…yeah! Mile 28. I’m trying to fly down to the campground while keeping my speed under control. Please protect me Lord! One of the guys passes me back. I make it to the bottom safely…thanks Jesus! On the long climb out, I pass the two remaining guys. Yeah! Now, will the pass stick. It remind myself that I only have a few more tough hills left. One at a time! On my way back to Canyon Way, I see Karen. She seems to be further back than expected. She is smiling and looking great though! Mile 42. I make the turn to the 5 mile out and back. For a moment, I actually am confused by which way to go. I know it’s right but I can see how folks can get confused in a split second decision. Maybe I’ll see Sarah flying down. This is the last long climb…yeah! Last year I really pushed hard here and try to again this time too. I see a few gals coming down the hill. Hum, duathlon folks? It’s hard to tell so I use it as motivation to push harder. I make the turn at the top and tuck into my aerobars. I don’t see Sarah so I know that she’s way out there now and creaming folks! As I’m heading down the hill, I can see some ladies behind me. Lots of motivation to push now! Mile 49. Going up the last tough hill…yeah! There are folks cheering and an aid station at the top. It’s what I need to get up and over! My average pace is slower than last year but it seems like I’m in a good position…maybe even the top lady? Finally, the finish line is here! I successfully pull my feet out of my bike shoes again! Troy set out my T2 gear so I follow his directions to the spot. Yeah! I run out a bit stiff but feeling descent. Now it’s time to see my family at the aid station and find out where I am. Mile 1 is 7:50. I’m feeling strong and hope I can keep this up. Last year the first lap of the 3 loop course went great and then I fell apart. We’ll see what happens. I make the turn to the aid station and see Troy. He announces to the crew that I’m coming. He runs up alongside me and starts to put sunscreen on my shoulders. I see Anna and her friend Lily with water and I grab one from both. There are so many familiar faces, young and older. There is Ariel too! I wish I could stop and hang out. At least I’ll be seeing them 2 more times! Troy stays with me and gets the sunscreen rubbed on good. Wow, what treatment! Mile 2 is 7:30. The downhill helped that split for sure. 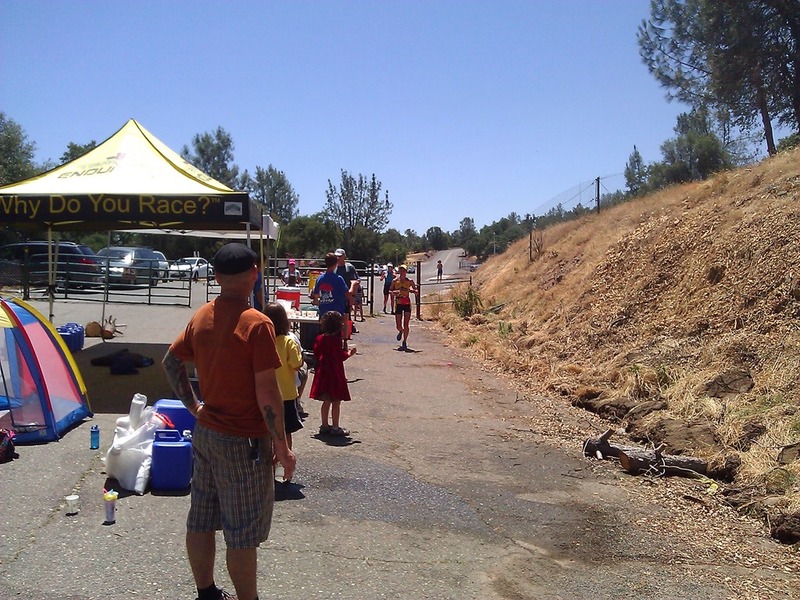 I pass the Sac Tri Club Aid station. They do a great job as always too! I see Mo coming and cheer her on. Their relay is doing so awesome! Stu’s trail is all cleaned up and looking good. I’m able to maintain some speed running through there. Mile 3 is 7:38. Great! I pass those few ladies I saw on the out and back of the bike course. I see now that they are duathlon. Could I be first? I see a gal coming out on the course and she has a big smile and encourages me. I encourage her back. I think I remember her going out on the bike. That is sweet of her to cheer! Mile 4 is 8:03. The climb out of the canyon felt great. I feel like I could do this loop again just as fast…but time will tell. I pass a girl going out and wonder if she was the race leader. Mile 5 is 7:54. A tad slower than the first lap but I’m still feeling strong. As I get out to our aid station, I see our friend Ellie Verdi from the track letting folks know I’m coming. This time the kids ask if I want to be splashed and I say yes. The water flies and it feels great. “How is Karen doing?” I find out they haven’t seen her yet…hum, where can she be? Troy tells me he thinks I’m leading the race. Wow, that would be awesome Lord! Mile 6 is 7:32. Though my pace is just seconds off of the first loop, I’m still hanging on. Mile 7 is 7:48. Stu’s trial once again! I see that gal again and she gives me some encouragement. What a great example she is! Mile 8 is 8:10. I don’t see Karen and wonder if I should try to tell the race officials when I get to T2. I feel the Lord telling me it’s going to work out and now to worry. I hit T2 for the last time. Next time I get back, I’m finishing! Mile 9 is 8:08. I can tell that this loop is going to be a challenge. I’d love to go my fastest but I’ll get what I get out of my legs. I see my favorite aid station for the last time. I get another splashing and plenty of cheers. I find out that Karen is on the course and doing great. Praise God! Troy tells me I’ve got the lead and to continue running strong. Wow, to think I could win this again is humbling and an honor. Lord, thank you no matter what! My bike was slower today but my run has been right on! Mile 10 is 7:54. I finally allow myself to grab some Coke a the Sac Tri Club aid station. I fold up the cup and decide to carry it further down the road. Mile 11 is 7:52. I drink the Coke I was able to carry. Aw, that tastes good! I want more! It’s good motivation to push back to the aid station. I see that sweet gal one last time. She’s still smiling and encouraging me. 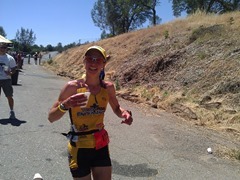 I also pass another gal on her 2nd loop that I remember from the Folsom Long Course last year. She’s also very encouraging and sweet! Mile 12 is 8:22. I get my Coke finally…yummy! Just a little more climbing and I’m out of here! I can see the finish now! I’m pushing with all I have. I don’t hear the announcer saying yet and I wonder if they know. 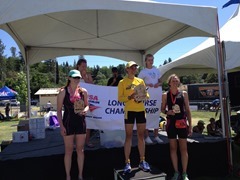 As I approach the finish I look up to the Lord and thank Him. This is all you Jesus! Thanks for a great day! I cross the finish! Yes, I am done!